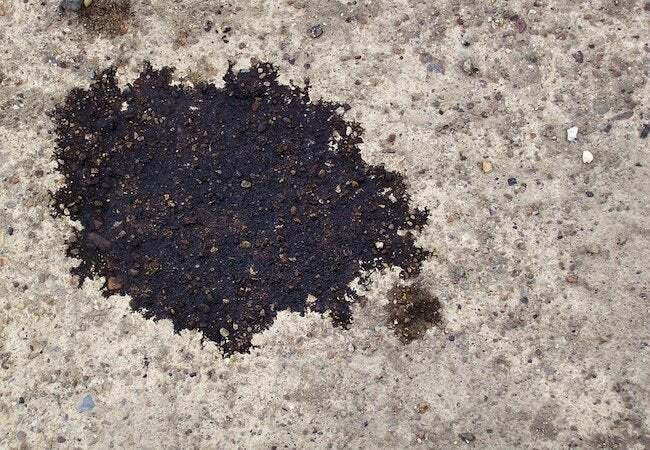 The next time your car drips oil onto your otherwise pristine asphalt driveway, try one of these reportedly effective cleaning methods—unlikely though they may sound. Oil spots on asphalt driveways certainly don’t add to a home’s curb appeal. Ask ten people what remedies they recommend for removing oil stains from concrete, and you’re likely to get ten different answers. • Granulated cat litter gets a lot of thumbs up. It’s especially effective if you cover the stain while it’s still fresh. • Powdered laundry detergent mixed into a paste seems to work well if you spread it over the stain, let it sit for awhile, then scrub with a broom and rinse. • Grease-cutting dish detergents coupled with a stiff broom are another strategy. • Other people swear by full-strength bleach. • Still others douse the stain with soda. Lots of companies tout commercial asphalt cleaning products, but reviews are mixed. In many cases, they don’t seem to perform any better than the household remedies. And forget about using a driveway sealer to hide oil spots; the oil will just eat its way back to the surface.